This is a special event task meant for six players. 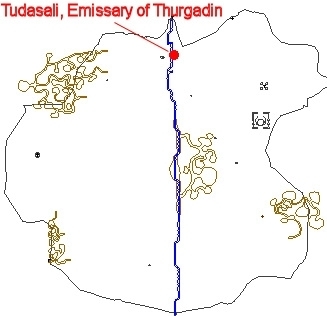 It is a monster mission that begins with a Coldain called "Tudasali, Emissary of Thurgadin" (click for map image) in the Great Divide. He is found at /loc -1050, -125, 25 (outside one of the guard towers just south of Thurgadin). It will only be available on Live servers for a limited time. You have been assigned the task 'Death, Death, Death!'. Tudasali has asked you to test yourself against the enemies of his people. You have 40 minutes to defeat as many as you can, as fast as you can. We will be tracking your progress in the task list. Each time you anger one of the foes on your list, your timer will start counting. Keep that timer short and defeat as you can, and you will do well. A monster mission window will pop up. You can select any of the 14 original classes (excludes Beastlord & Berserker). Gear they come with is Level 50 quality from its original era. You have selected template: Classic _____. You have entered FFEvent - South Desert of Ro. Slain bosses leave behind chests near Tudasali with items that may help you progress. First up is the Ancient Cyclops of South Ro which will be a relatively simple kill. Note that the task LOCKS upon its death. an ancient cyclops has been slain by _____! Next up is Cazel, in the same zone, followed by the others as ordered above. This task works like the "Dragons, Dragons, Dragons" and "Giants, Giants, Giants" in that you'll zone from instance to instance where (most of the time) the only mobs that will be up are your targets. "Tudasali, Emissary of Thurgadin" will spawn in each zone as you defeat the targets, and you'll use him to port to the next target. - Death, Death, Death - Increased the time limit from 40 to 60 minutes. - Death, Death, Death - Slain bosses leave behind chests near Tudasali with items that may help you progress. Made it to Velektor with 3 people. Set up was mage, necro, and cleric. The strat was pretty much just spam pets at the mobs and let them do the work. The first two titles are acquired after killing the first three (cyclops, cazel, naggy) and the second three (vox, dracliche, gorenaire). The timer starts as soon as you get the task. The mobs are scaled down in power to be one groupable. We didn't really have a challenge until gorenaire and that wasn't difficult. Also, you are only able to choose one of each class. This task seems to be a combination of Dragons, Giants, and Old Man Mckenzie. Can confirm all of these up to Yelinak are right, my group ran out of time at Yelinak, but does anyone know the reward for doing this? The reward is the titles from the event. 6 players in old school gear going up against Vulak? Is that even possible to win?? <Eternal Sovereign> and I believe one other group beat Yelinak during SOE Live 2013. This was followed by Vulak, also beaten, and then the 4 warders in Sleepers Tomb (none beaten). Unsure if this is changed in the 2014 Version as I haven't tested it yet.